His “Forward Operating Base” is in an alleyway behind a bar a few hundred yards from Fenway Park. In a season when the battle has essentially ended on the field at Fenway Park, there is an intense war going on in the streets around it involving rival gangs of program vendors — The Hawker Games. In one corner, we have Boston Baseball, the unofficial game-day “program” that has owned the market around Fenway since the late ’80s, protected from the big club by the First Amendment. In the other corner, we have Sly Egidio, who was fired by Boston Baseball after two decades as its signature hawker. He was so upset he created a rival publication, Yawkey Way Report, with a single goal: to destroy Boston Baseball. It is partly a business plan but mostly an elaborate revenge plot against Mike Rutstein, his former boss at Boston Baseball. Most everything Egidio says is a war metaphor, a “Star Wars” metaphor, or a baseball metaphor. He’s 37, was a Marine for 8 years, and likes to talk about it a lot, usually by telling you that he can’t talk about it. But there’s no question that tactical aggression is the great love of his life. Sly Egidio (right) worked for a long time selling Boston Baseball, but after he was fired he created the rival Yawkey Way Report. 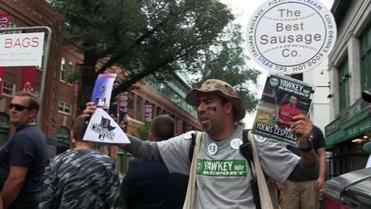 If you’ve been to Fenway Park in the last 20-something years, you might recognize Sly Egidio. 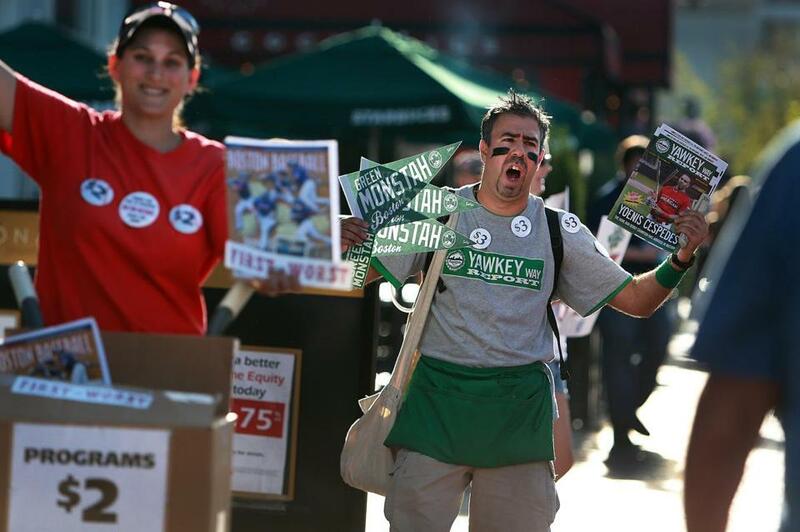 Most game days, he’s standing atop a milk crate outside Gate A, at the corner of Yawkey Way and Brookline Avenue, selling programs in that chaotic area hawkers call “The Pit.” He usually wears a batting helmet or an army helmet, and he always wears eye black, which he puts on ritualistically before each game. When he worked for Boston Baseball, Egidio was both a star employee and the problem employee, Rutstein said. He’s an incredible salesman, Rutstein acknowledges, capable of spouting “verbal gold.” But after firing him “four or five times,” usually over claims of aggression from other employees — Egidio denies all these claims — Rutstein says he finally fired him for good two summers ago. So Egidio went to war. Egidio’s strategy is very specific: He stations his hawkers right next to Rutstein’s but sells the Yawkey Way Report for $3, a dollar more than Boston Baseball. How he gets that extra dollar is with a giveaway, a freebie thrown in, everything from pennants and baseball cards to ponchos and tote bags. He gets the giveaways from the surplus at Beantown Collectibles, a business Egidio started on the side in 2004 that sells everything from sports memorabilia to war mementos and original “Star Wars” toys. His inventory fills a huge warehouse underneath a Planet Fitness off McClellan Highway in East Boston. Rutstein has made complaints to city code enforcement that the souvenir giveaways essentially make Yawkey Way Report an illegal souvenir business. When he worked for Boston Baseball, Egidio was both a star employee and the problem employee. In 1992, those same city code enforcement officers went after Rutstein in criminal court, contending his hawkers were occupying city property without a permit. The case received considerable media attention, and Rutstein was prepared to mount a First Amendment defense, but the city never pursued the charges and he said he has not been bothered since. As Egidio’s troops head out with their assignments for the night, he puts on his eye black and a walkie-talkie — “Communication is the key to adapting to the enemy” — and pushes his stack of milk crates toward the ballpark. He checks in with his troops in The Pit — they’re jawing elbow-to-elbow with Rutstein’s hawkers, as he likes — and stops on the bridge over the Mass Pike to reposition a new employee in the middle of the sidewalk. “Make them go around you,” he says to the teenager. Then, instead of his usual spot in The Pit, he heads for the exit of the MBTA station in Kenmore Square. “I’m going to lead from the front and lay down cover for my guys behind me,” he says. Once there, he sets up just in front of a guy in Elvis sunglasses selling Boston Baseball, ascends his milk crate, and joins the scalpers in crisp white sneakers and a couple of college kids handing out “K” cards in that white noise that is Fenway Park on game day. “You get a free Pedroia gift bag with today’s program!” he shouts, hundreds of times, over and over and over, stopping occasionally to look over his shoulder and keep tabs on his competition. Rutstein is now trying to sell Boston Baseball. He insists it’s not because of Sly’s war but because he’s been doing it for 25 years, half his life, and wants to focus on his other business. He’s written books about the War of 1812 and used his program money — he said he’s sold 2.5 million copies of Boston Baseball — to build a replica of a war schooner, the Fame. He runs a business offering sailing tours on the Fame out of Salem.